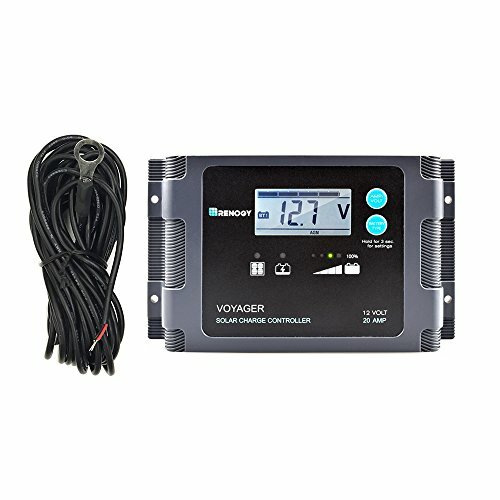 The 20A Voyager is Renogy's first waterproof PWM charge controller. Featuring a sophisticated and comprehensive LED bar for charge state identification and a bright blue back-lit LCD for displaying system information including error codes, the Voyager was engineered to be of world-class quality. Suitable for 12V off-grid applications, the Voyager can charge up to 7 different battery types, including lithium ion! Ensure your batteries's longevity thanks to its advanced and efficient 5-Stage battery charging algorithm and stay worry-free as the Voyager is equipped with multiple electronic protections. Optimized for 12V system, with 7 battery types compatible - Lithium-ion, LiFePO4, LTO, Gel, AGM, Flooded, and Calcium. Smart 5 Stage PWM charging (Soft-Start, Bulk, Boost, Float and Equalization) and temperature compensation increases battery life and improves system performance. Intelligent protection against: reverse polarity, over-voltage, over-temperature and reverse current. Waterproof design, suitable for indoor or outdoor use. Backlit LCD screen for displaying operating information and error codes, LED Bar for easy to read charge state and battery information. The Voyager is a negative ground controller. This ensure compatibility with any negative ground system, which is the standard and most conventional way of grounding. Any negative connection on the solar module, battery and load can be safely earth grounded as required. If you have any questions about this product by Renogy, contact us by completing and submitting the form below. If you are looking for a specif part number, please include it with your message.